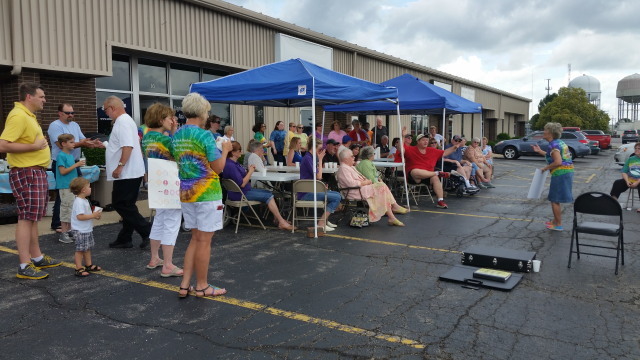 June 14th we had an open house from 12:30 to 3:30 at our new headquarters in Peoria, Illinois. At least a hundred visitors passed through our facilities throughout the day and enjoyed the free BBQ pork sandwiches, hot dogs and drinks. 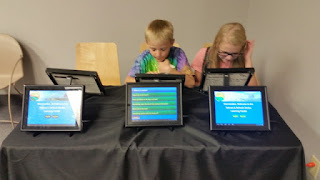 Here is a brief tour of what our visitors were here to see. 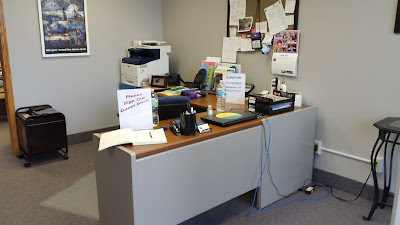 I'll start with the offices of our Executive Director, Associate Director, Camp Coordinator and Administrative Assistant. As you enter the front door you will be greeted by our Camp Coordinator, Lauren, who is not at her desk right now because she's helping our visitors, our chimes choir and with the many fun things we presented. Lauren organizes our sponsors, camp locations, volunteers, equipment, travel, schedules, pretty much everything that makes our camps run so smoothly. 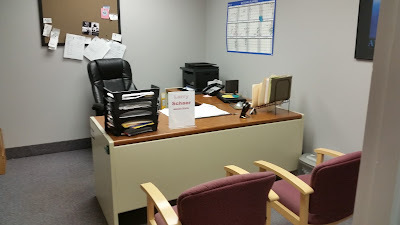 A little further in is the office of our associate director, Larry, who is not at his desk either because he is out in the parking lot greeting incoming visitors. Larry finds sponsors for our camps, scouts for suitable, handicap accessible camp locations, and also is the nation-wide manager of our Strike Out Stroke division. Strike Out Stroke is a nation-wide organization providing stroke awareness and education through major league baseball teams. At the back of the building is Marylee's office. Marylee is our Executive Director. She does everything else plus make sure the rest of us do everything else as well. Without her and her husband John there would not be a camp. 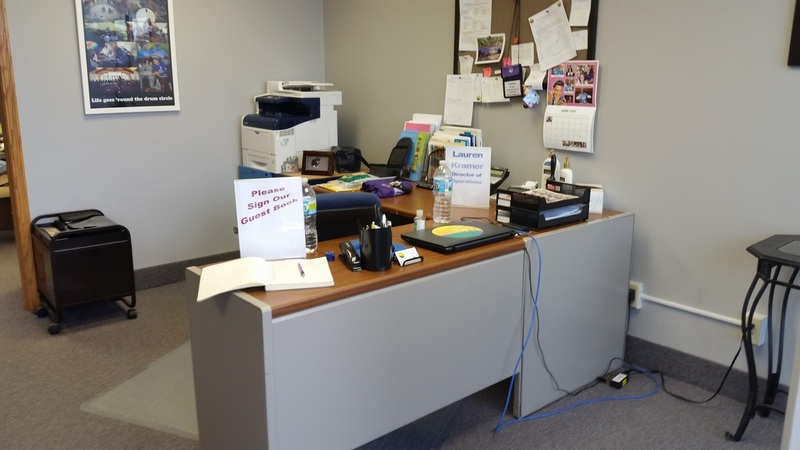 We have a new member of our staff, Martha, who is taking care of our multitude of administrative tasks plus office maintenance, and her office is between Larry's and Lauren's. For some reason I don't have a picture of her desk. 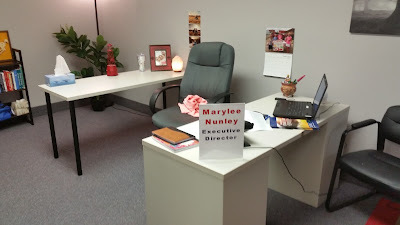 Her office looks similar to the others and is even a little bigger. 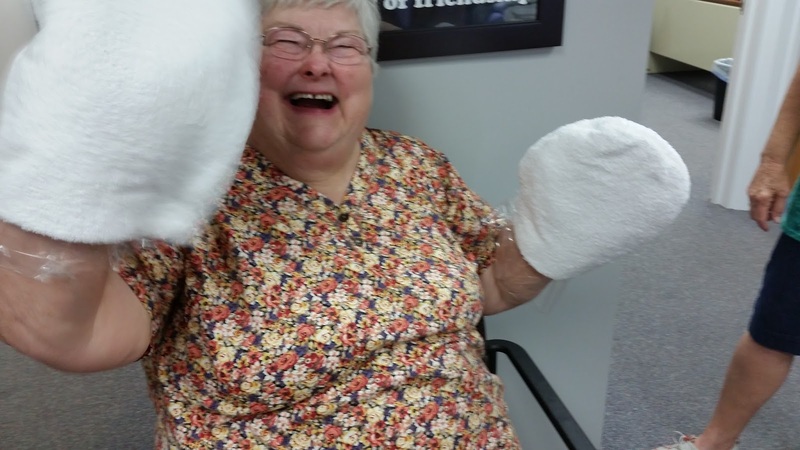 She's not at her desk either because she's helping with paraffin dips, which I'll explain later. One of the entertaining events at the open house was our chimes choir. The choir members are stroke survivors, primarily, and their caregivers, and is led by Susan, one of our Music Therapists, and Lauren, who is also a Music Therapist in addition to being our camp coordinator. Each member has a chime instrument that produces a unique and beautiful tone. With Susan's and Lauren's direction and Monica the soloist and a caregiver herself, they create a symphony that can bring tears to your eyes. That's Monica standing behind the choir. Another fun thing to do was a game of Bags played similar to horseshoes. The idea is to get the bag in the hole or be the closest team bag on the board. Remember me mentioning paraffin dip? Here's how it's done. ...put your hand inside the soft cotton glove, and let the magic soak in. This is very popular at the camps. Here is our meeting/recreation/chimes choir practice room. During the open house, Sarah, Marylee's sister, led some of the attendees in a drum circle. Another popular and frequent event at our camps. We also had our educational learning center set up to promote stroke education and awareness. The highlight of the open house was when Marylee's brother, Rodney, presented a check for ten thousand dollars to the camp in memory of his late wife, Meme. Rodney and Meme have been terrific supporters and active in camp events for many years. 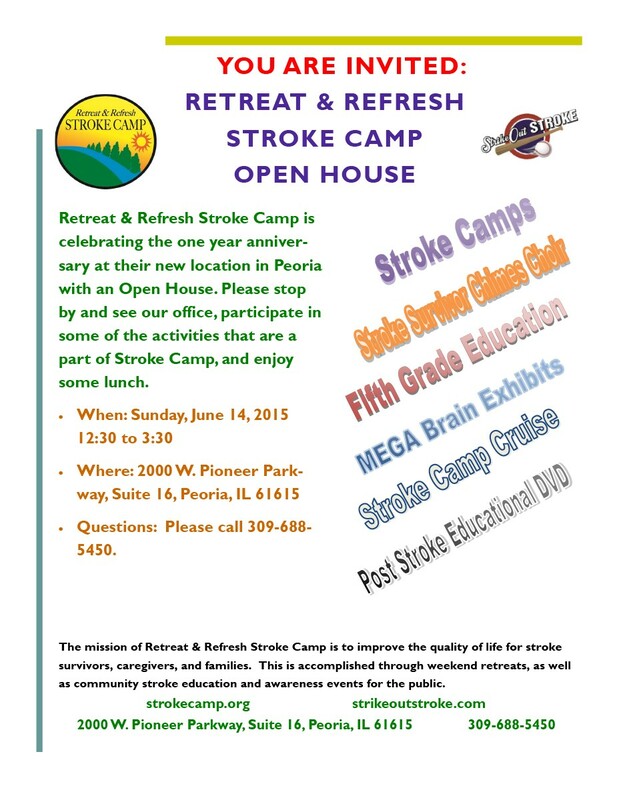 Through his generosity many stroke survivors who could not otherwise be able to afford to attend camp will now be able to. Thank you Rodney! We and many less fortunate stroke survivors are blessed to have you and your support. 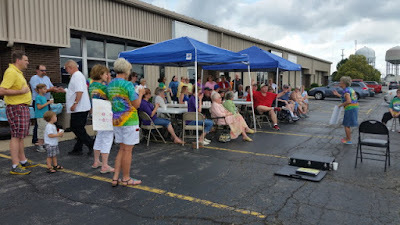 I would also like to give a thank you to all the volunteers who helped make our open house special, and a special thanks to one of our voluteers, Tony Ozella, and the Knights of Columbus of Washington, Illinois for the use of their tent and BBQ grills, and a thanks to Earl and Carol Lee for the use of their tents. 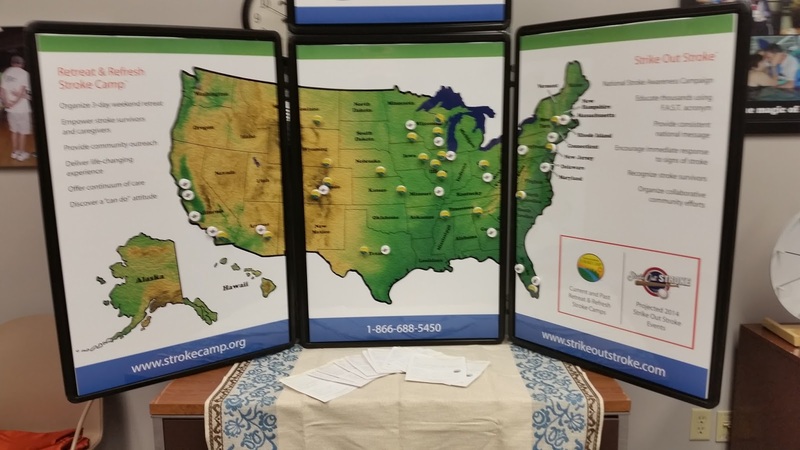 We've come a long way since our first camp in 2004. Where are we now? Maybe this will help you appreciare our growth. Each circle represents either a camp location (yellow) or a major league baseball game where we've done a Strike Out Stroke event (white). Spasticity is tight, stiff muscles that make movement difficult or even impossible. Also called tone or tightness, spasticity can cause pain, abnormal posture, and uncontrollable movements. Spasticity can occur anywhere in the body, but it is most common in the arm typically with a closed fist, bent wrist, and flexed elbow. Needless to say, this can make common activities like dressing and eating very difficult. In legs, spasticity causes a stiff knee and a pointed foot. It can also cause involuntary movements, which may include spasms and clonus (a series of fast involuntary contractions). Orthotics, such as ankle-foot braces (AFOs), are sometimes used to limit spasticity in legs. Nearly one out of every three patients may have spasticity after a stroke, and approximately 40% of them still have spasticity at 12 months post-stroke. In a survey done by the National Stroke Association, while 58% of survivors in the survey experienced spasticity, only 51% of those had received treatment for the condition. The cause of spasticity is not totally understood, but basically it entails damage to the part of the brain that controls voluntary movement. Without daily physical rehab, the muscles will remain contracted and joints become immobile. For best results during stroke rehab, therapy such as stretching and strengthening exercises work best and are typically the first line of treatment. Strategies include moving of the affected limb early in rehabilitation and sustainedstretching. Splinting and ice packs are other strategies that can be used to temporarily decrease the extent of spasticity. Oral medications for spasticity include medications such as Valium or Baclofen, which relaxes muscles by acting on the central nervous system. They can decrease muscle spasms, tightness, and pain and improve range of motion. The problem with oral medications is their side-effects like sleepiness. Baclofen can also be given as an injection within the space surrounding the spinal cord (this is called intrathecal injections). However, this this requires surgical implantation of a pump that delivers the drug to the spinal cord. Injections are administered directly into the spastic muscle by blocking chemicals that make muscles tight. Commonly used is the botulinum toxin (Botox) or Phenol. These injections usually improve muscle stiffness within two to four weeks. In severe cases, surgery is an option. This includes includes lengthening or releasing of muscle and tendons and cutting selective sensory nerve roots. But "the Holy Grail for spasticity reduction is a melding of doctor-prescribed medical interventions and therapist-delivered neuroplastic treatment options," as Peter Levine says in his book "Stronger After Stroke". Seizures are caused by sudden disorganized electrical activity in the brain and be can be characterized by spasms or convulsions. About 10% of stroke survivors experience seizures. In the first few weeks following a stroke some stroke survivors will experience a seizure. As a general rule, seizures that first occur immediately shortly after a stroke are unlikely to became a permanent, recurrent disorder. On the other hand, seizures that first occur weeks or months after a stroke can be a recurring problem and require medication. Seizures like this are also know as stroke-related epilepsy. Some physicians will prescribe a temporary anti-seizure medication as a preventative measure immediately after a stroke even if no seizure has occurred. This is most often done in the case of hemorrhagic strokes, which are more prone to seizures rather than ischemic strokes. Stroke-related epilepsy can typically be fully controlled with anti-seizure medicines. More than 20 different anti-seizure medications are available today, all with different benefits and side effects. Taking medications regularly as prescribed is very important in post-stroke seizure management. The latest studies of post-stroke seizure treatment show that newer drugs, such as lamotrigine, gabapentin, and levetiracetam, in low doses are often prescribed because of their high rate of long-term seizure-free periods, improved safety profile, and fewer interactions with other drugs, especially anticoagulant ones. Work with your doctor to find the best medicines for you. Don't restrict the person from moving or wandering unless he or she is in danger. Do NOT put anything into the person's mouth, not even medicine or liquid. These can cause choking or damage to the person's jaw, tongue, or teeth. Remember, people cannot swallow their tongues during a seizure or any other time. Remove any dangerous objects the person might hit or walk into during the seizure. The person does not begin breathing normally or does not regain consciousness after the seizure stops.